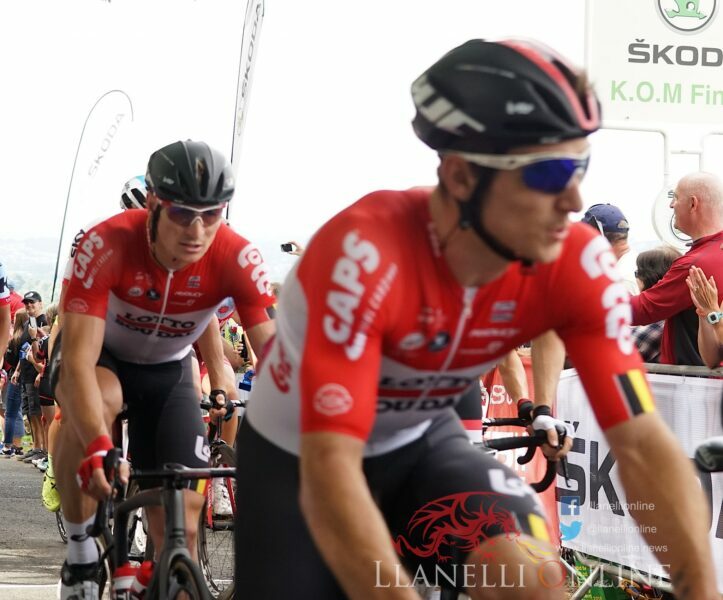 ANDRE Greipel from Team LTS is the first stage winner of the Tour of Britain, which began today, Sunday (Sep 2) at Pembrey Country Park. 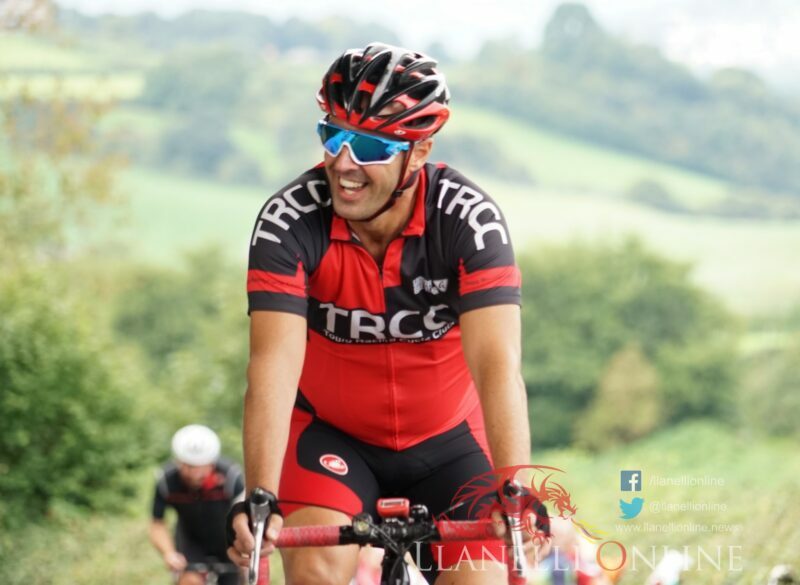 He finished with a time of 04:00:44. 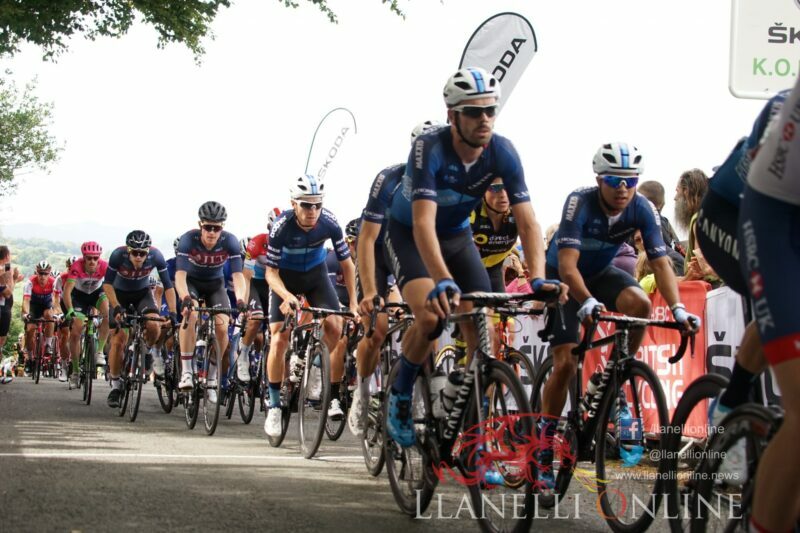 Ewan Caleb Team MTS 2nd and Galviria Fernando Team QST 3rd. 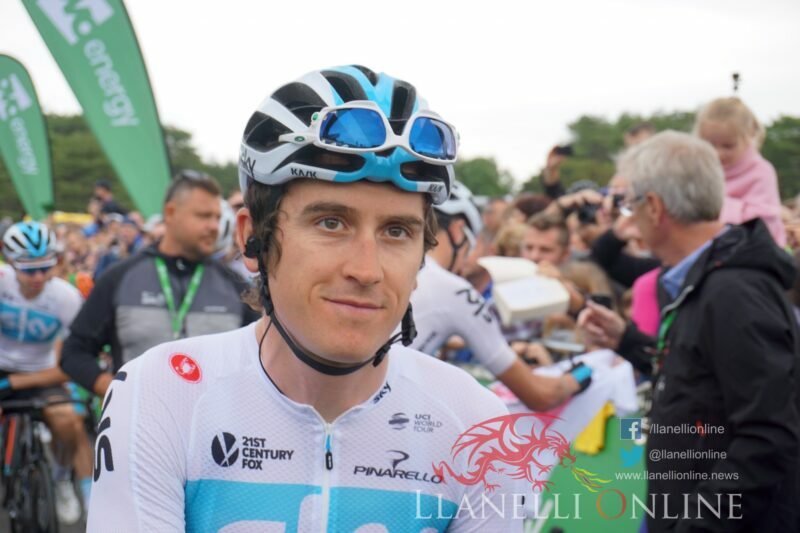 Geraint Thomas finished in 77th place. 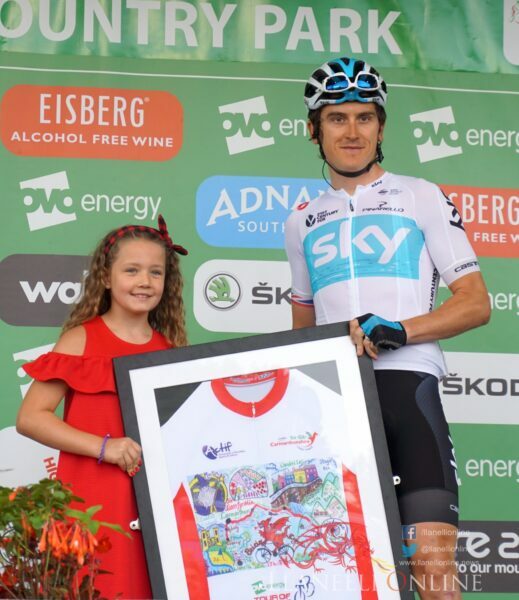 Nicholas Dlamini took the Skoda King of the Mountains Jersey with impressive finishes on Bethlehem Hill and Defynnog Hill. 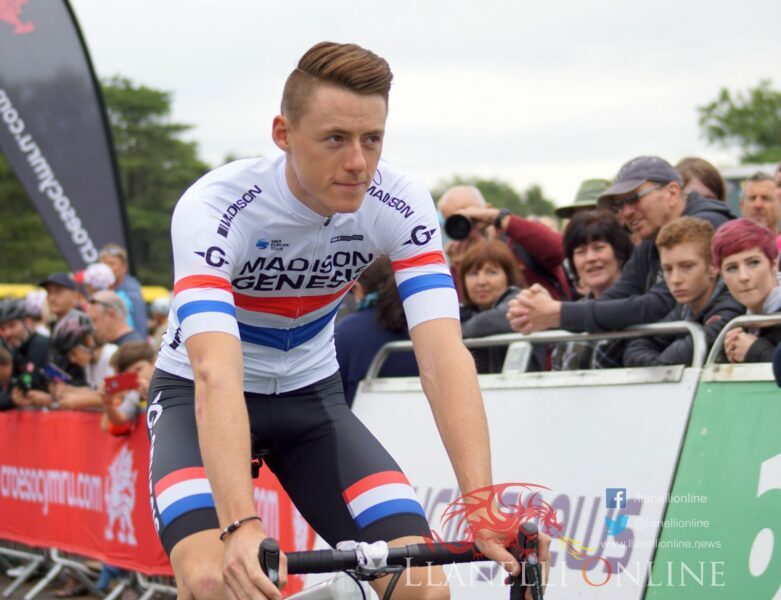 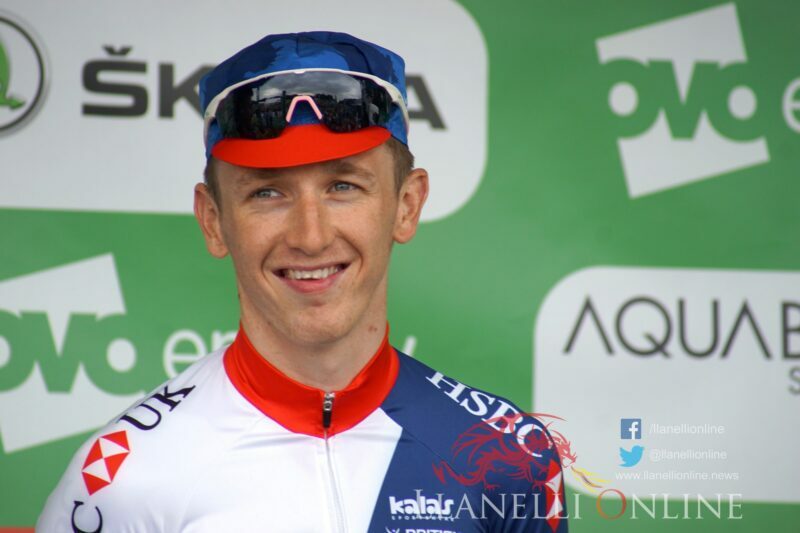 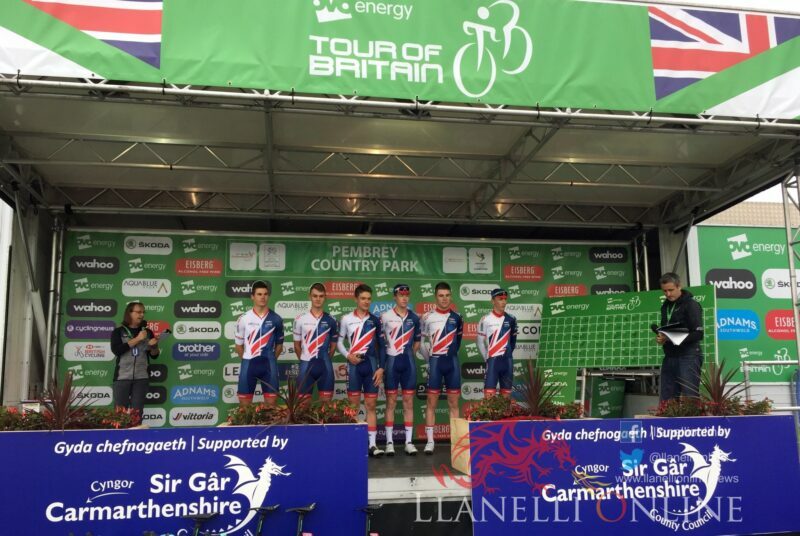 Mathew Bostock Team GBR took the Sprint Jersey and best Combative Rider while Team GBR took the lead team position. 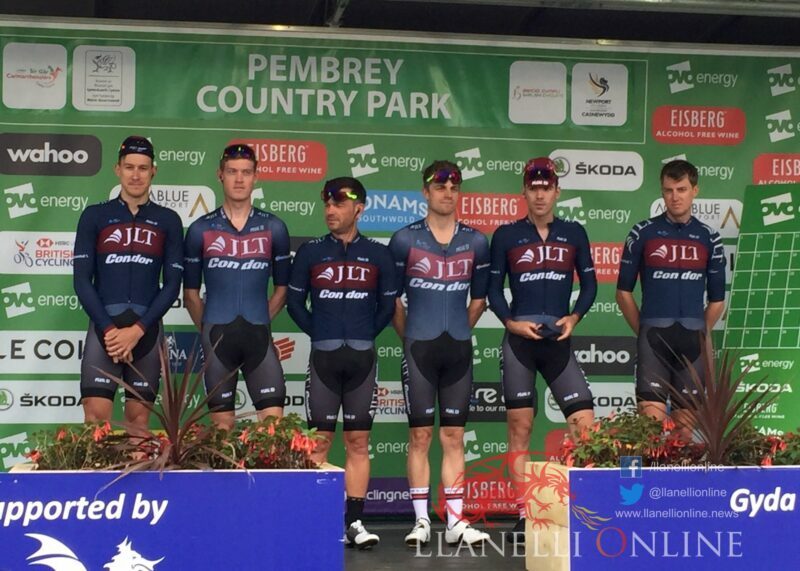 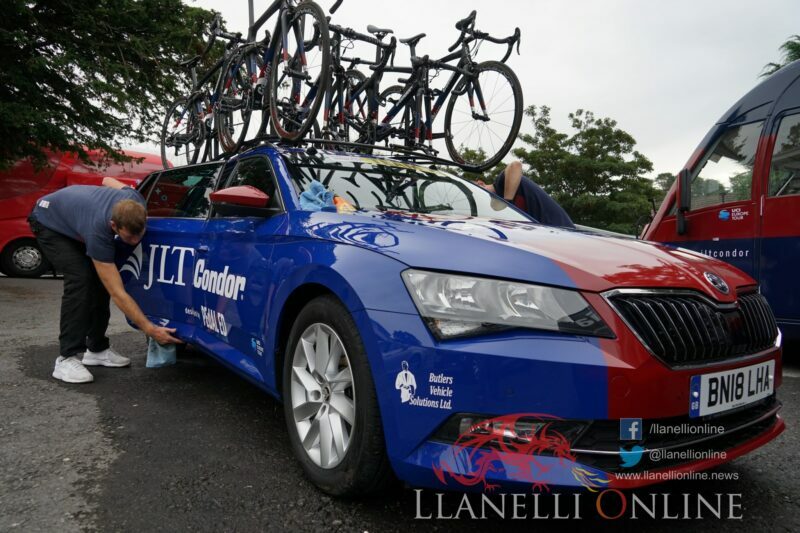 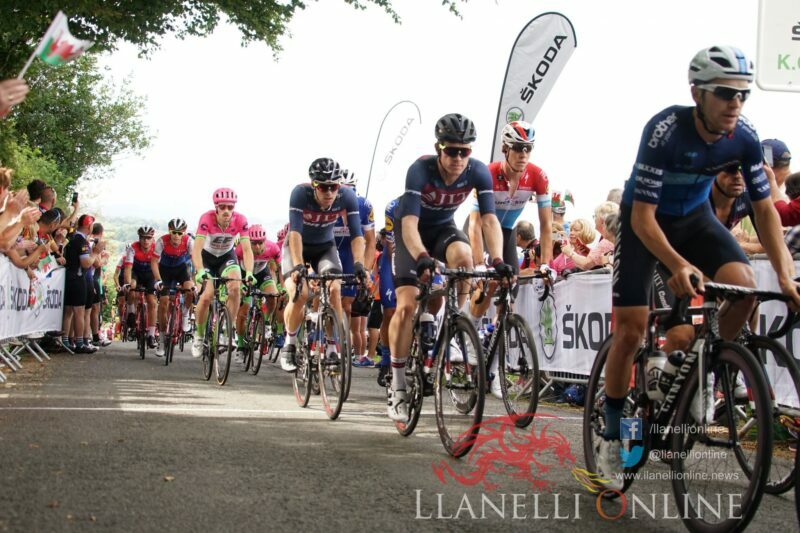 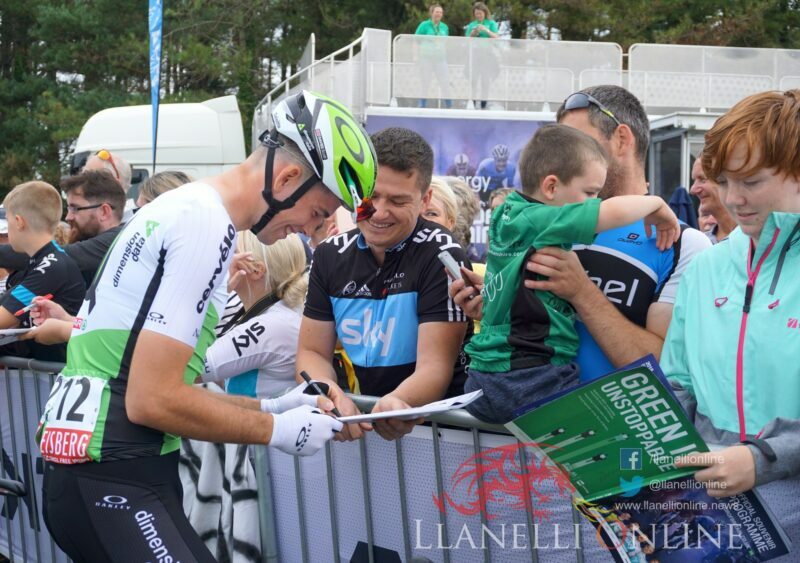 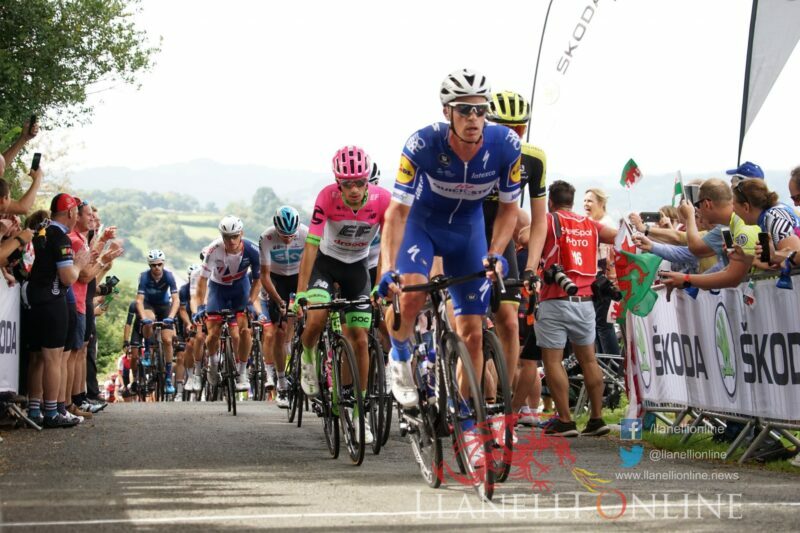 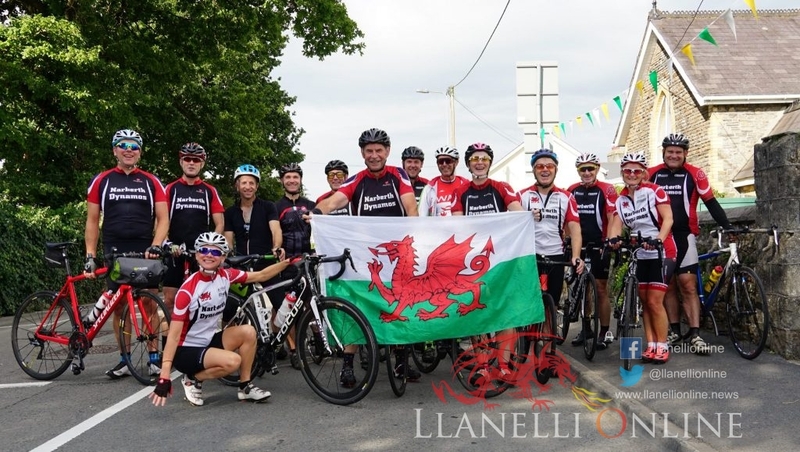 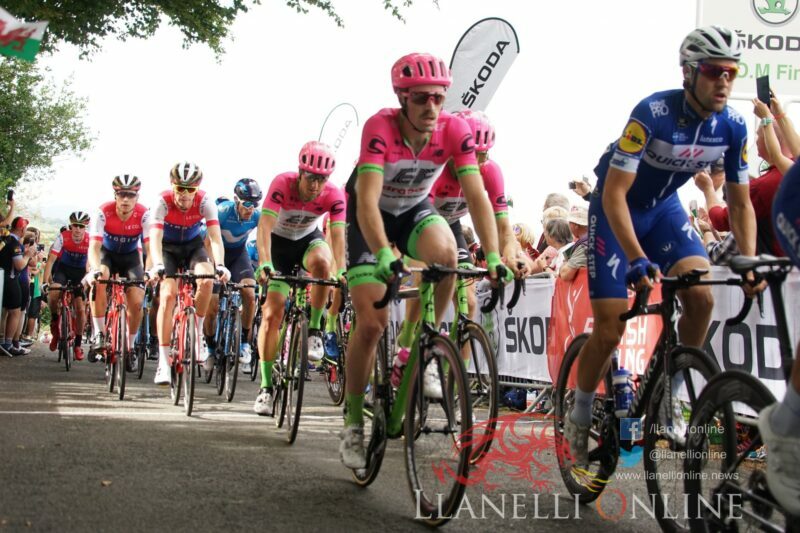 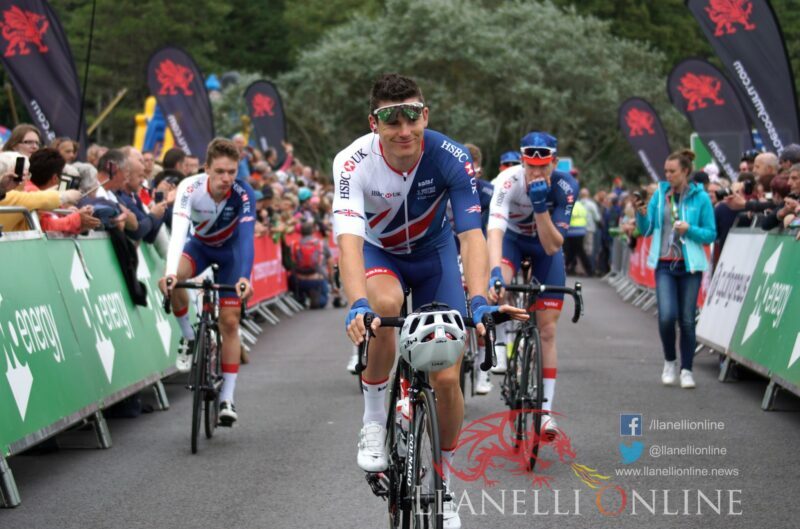 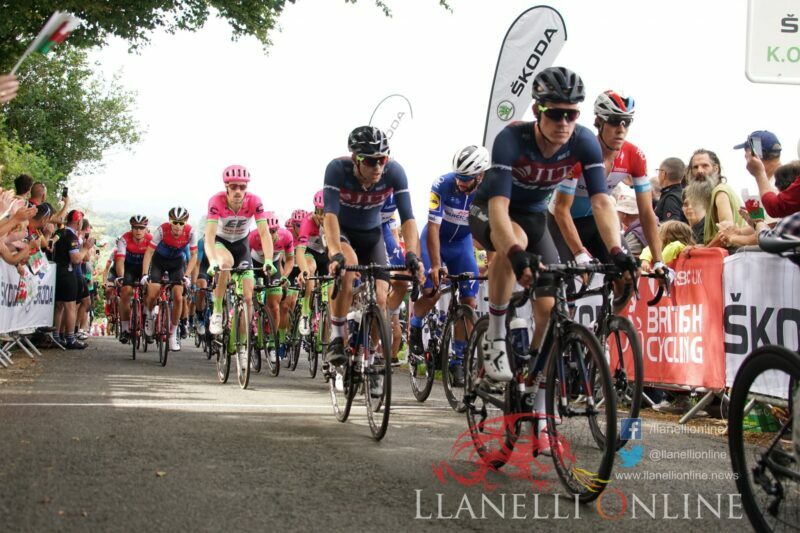 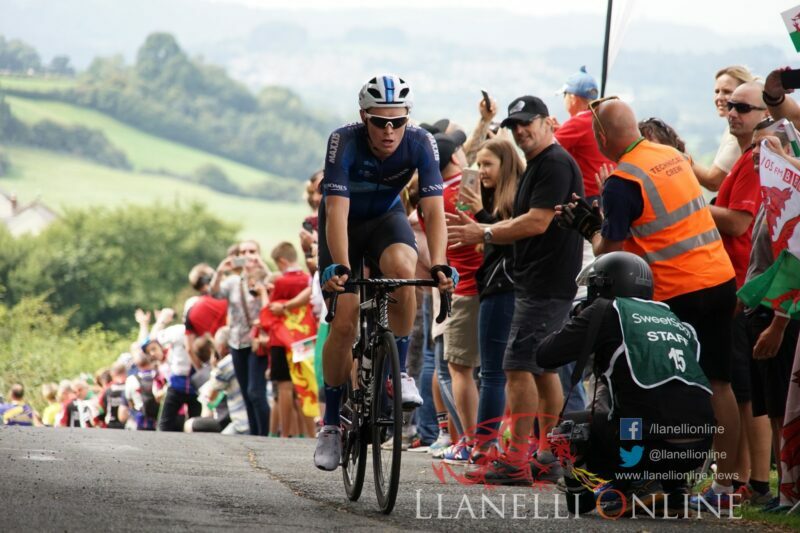 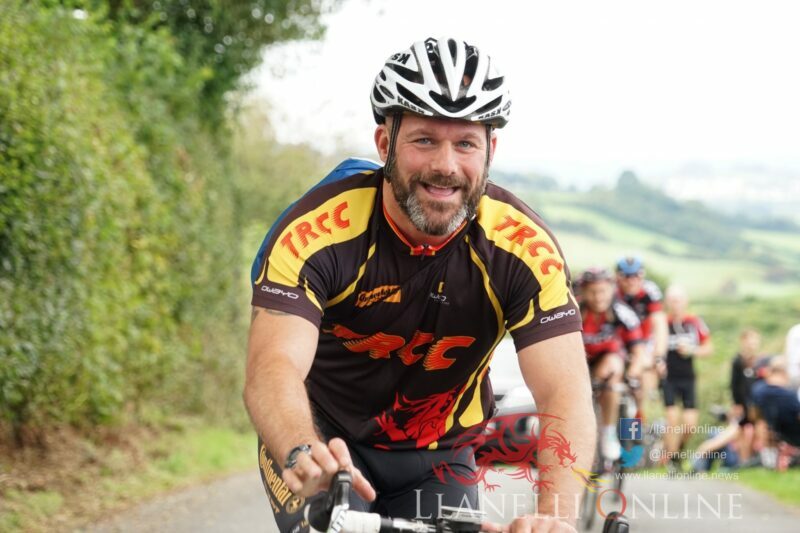 Thousands of people lined the route from Pembrey to Llandovery as the Tour made its way through Carmarthenshire. 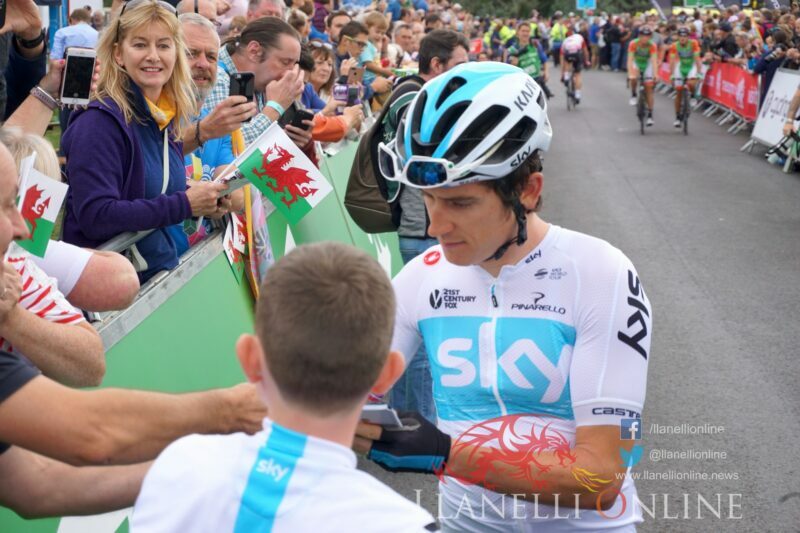 Crowds had gathered at the start to welcome the riders onto the podium. 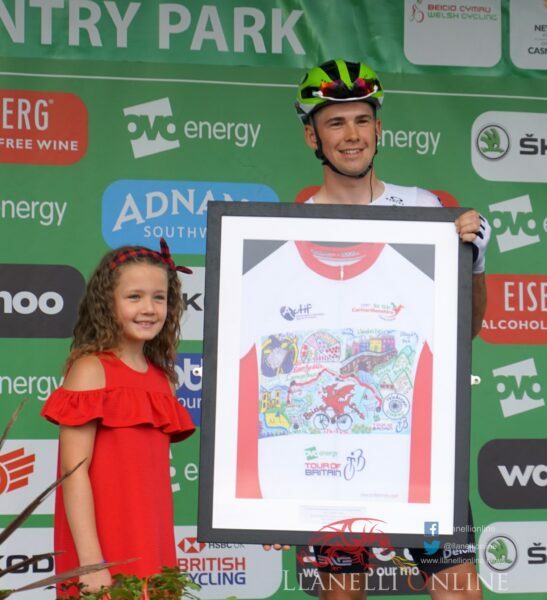 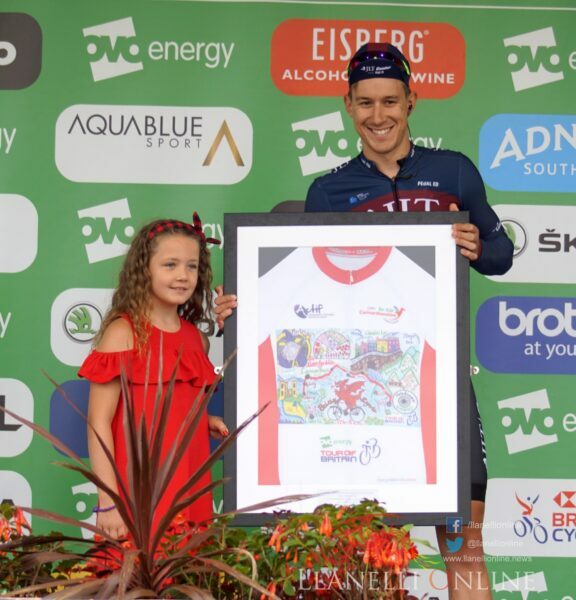 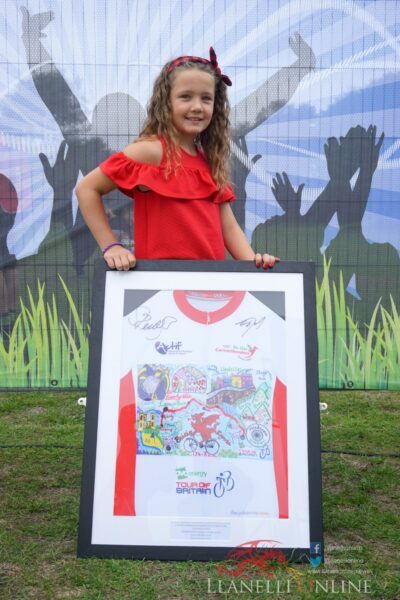 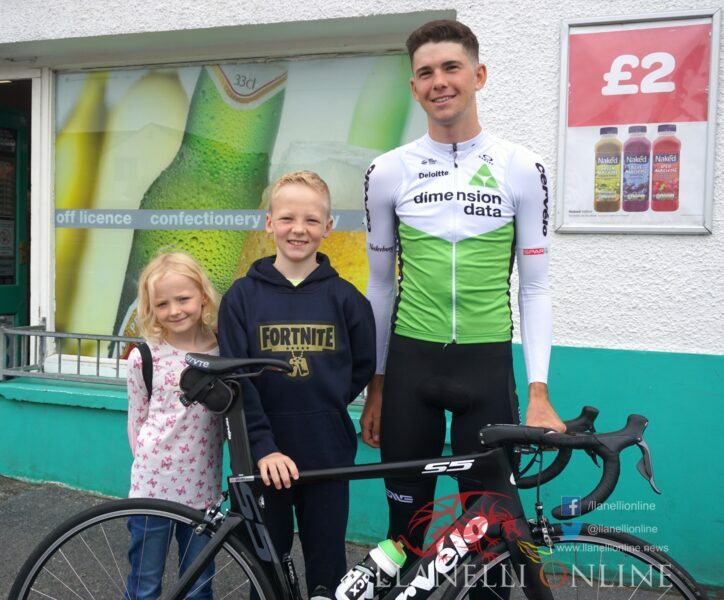 Carmarthenshire Design a Jersey Tour of Britain 2018 winner was Zakia Bella Johnson who got to present the jersey to some of the riders including her favourite Geraint Thomas. 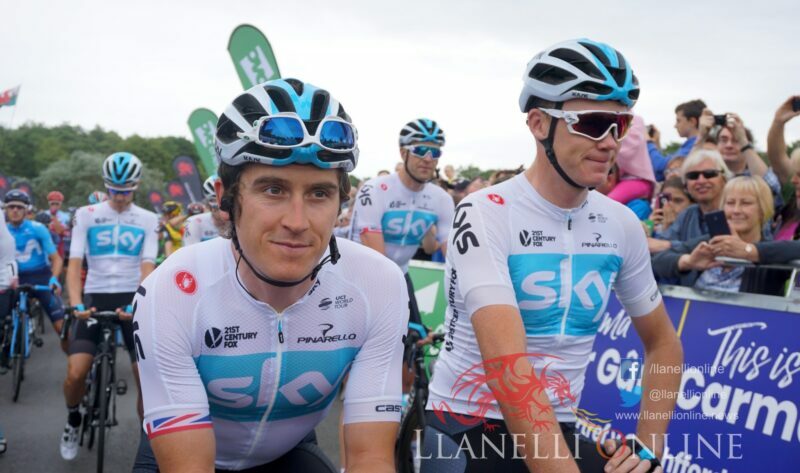 Many of the teams stayed at local hotels over the weekend including Team Sky who stayed at the Stradey Park Hotel. 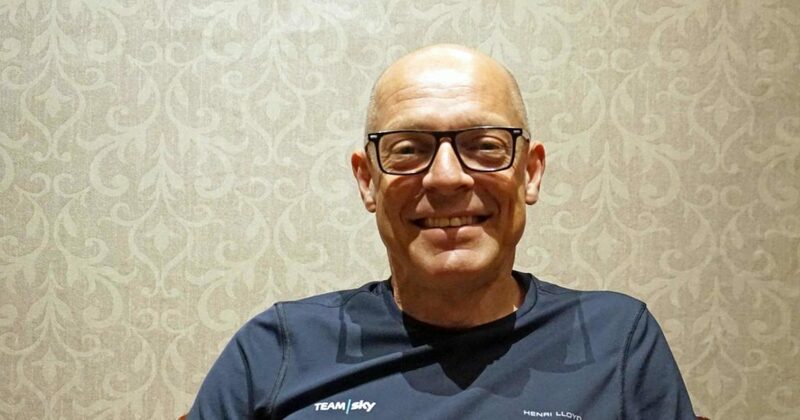 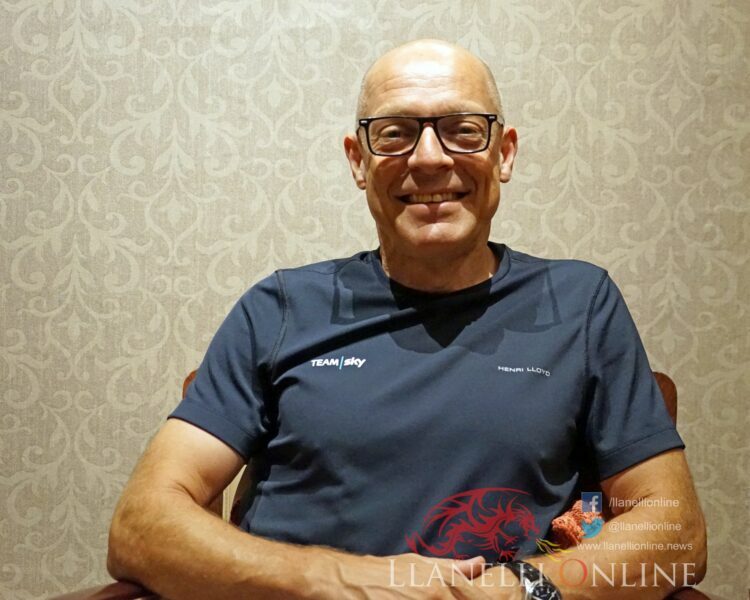 We caught up with Sir David Brailsford, Geraint Thomas and Chris Froome and they were all in good spirits. 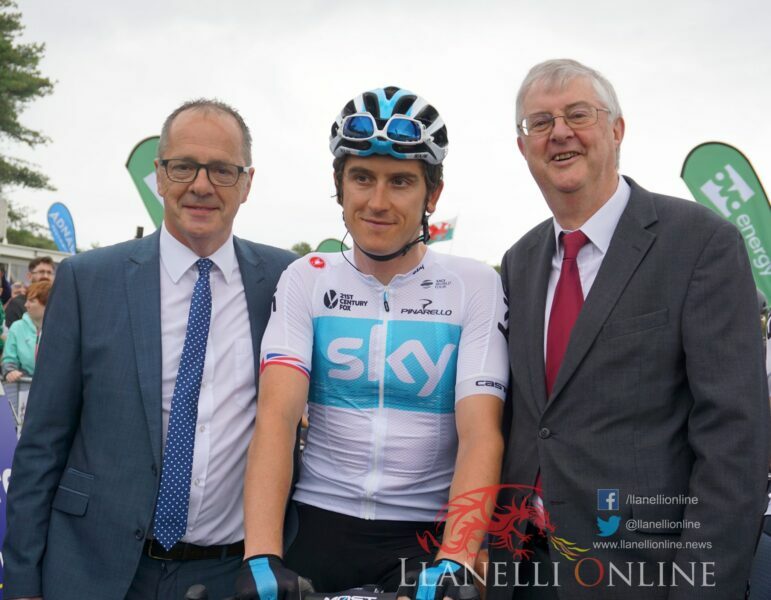 Sir David said that it was wonderful to be in Carmarthenshire and that he loved the countryside. 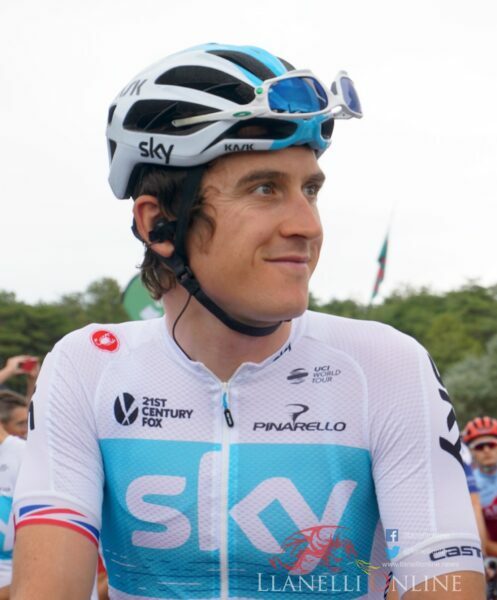 When asked about the dilemma he faced during the Tour De France when a decision had to be made about who would become team leader Sir David said: “It played itself out in the end.” He also said that he was not enamelled by the treatment received by Chris Froome and said that the team had had a great welcome when in Germany and in Spain. 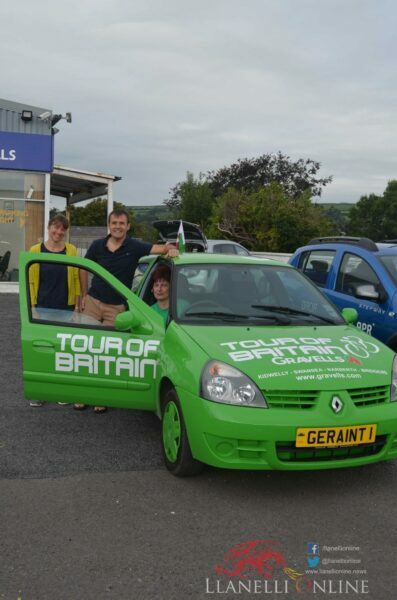 “It’s a Tour De France thing” he said. 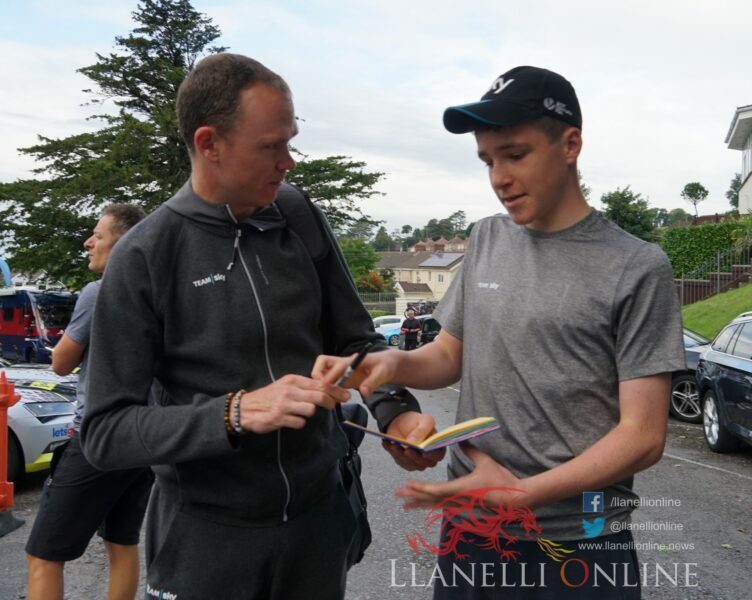 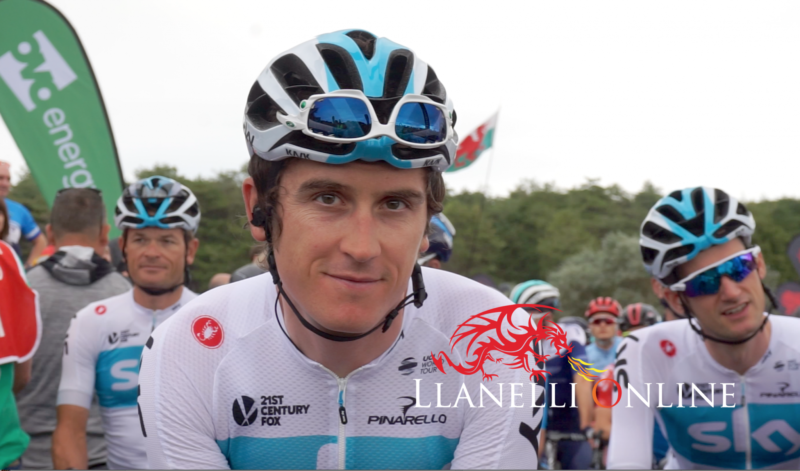 Geraint Thomas spoke about his links to the area. 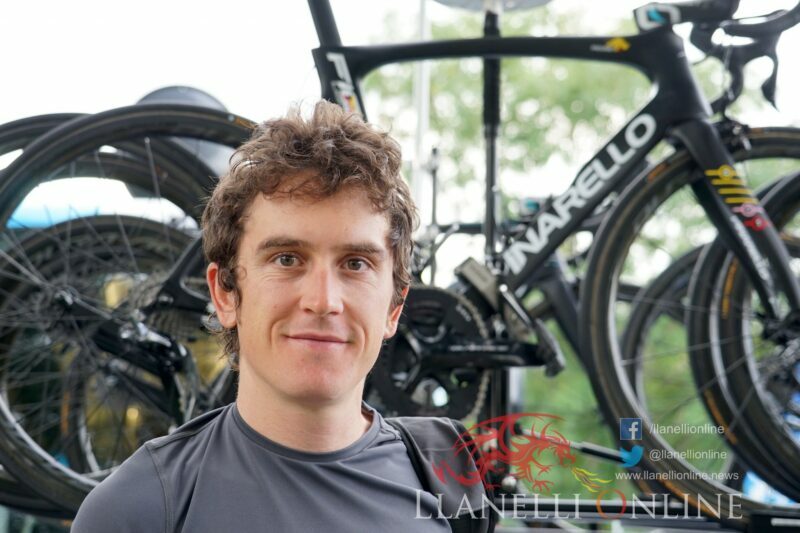 He said that he had cycled through Carmarthenshire on many occasions on his way to Tenby. 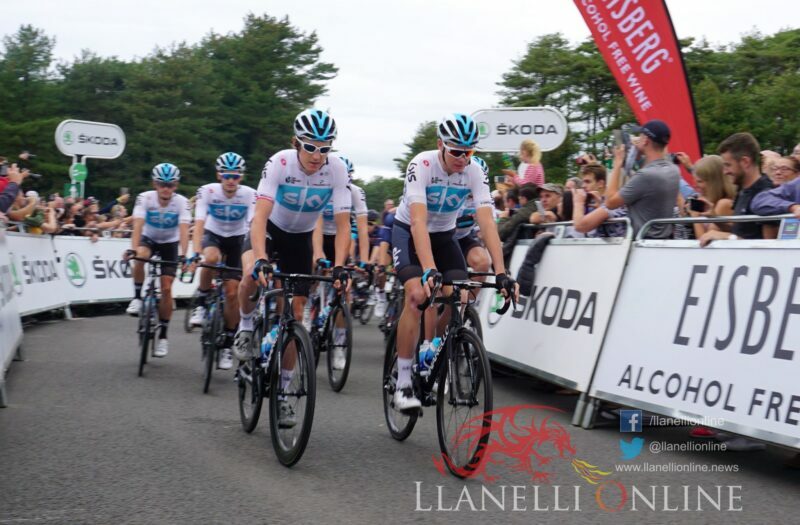 Asked if he was going to win he said: “Me, no, I am just going to ride to support the team.” Chris Froome also said that he was enjoying his time in Wales and was looking forward to riding through the countryside. 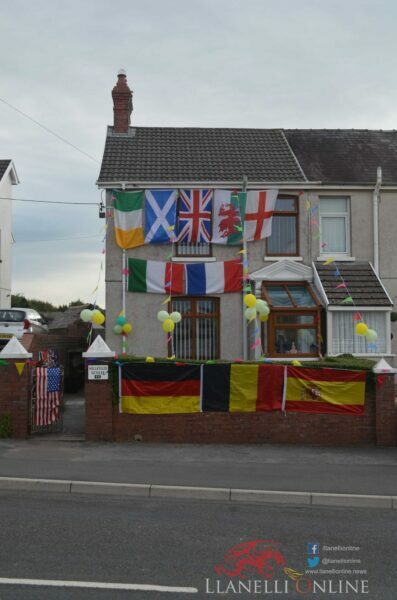 Hundreds of people lined the streets of Kidwelly where the shop owners had made an effort to decorate their premises. 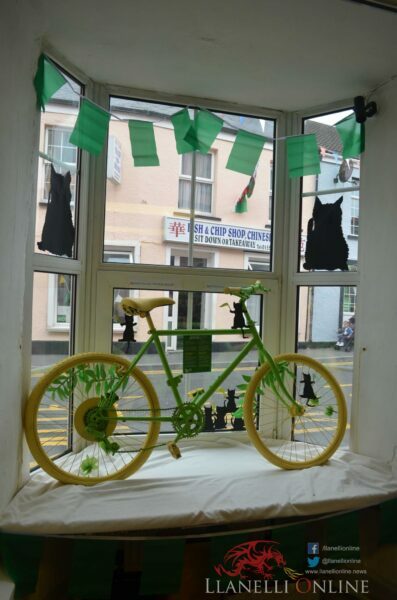 There were plenty of green bicycles, black cats and Welsh flags on show. 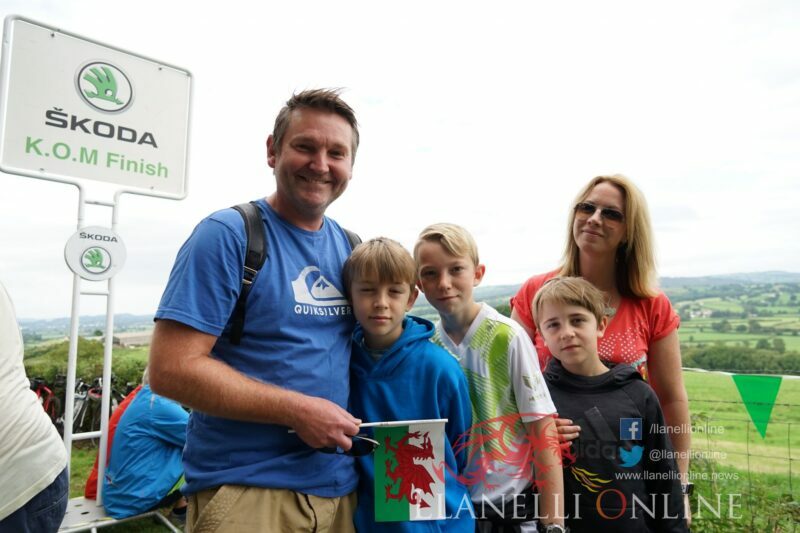 It was the same at Ffairfach where the local school opened its doors to sell hot dogs and refreshments to visitors. 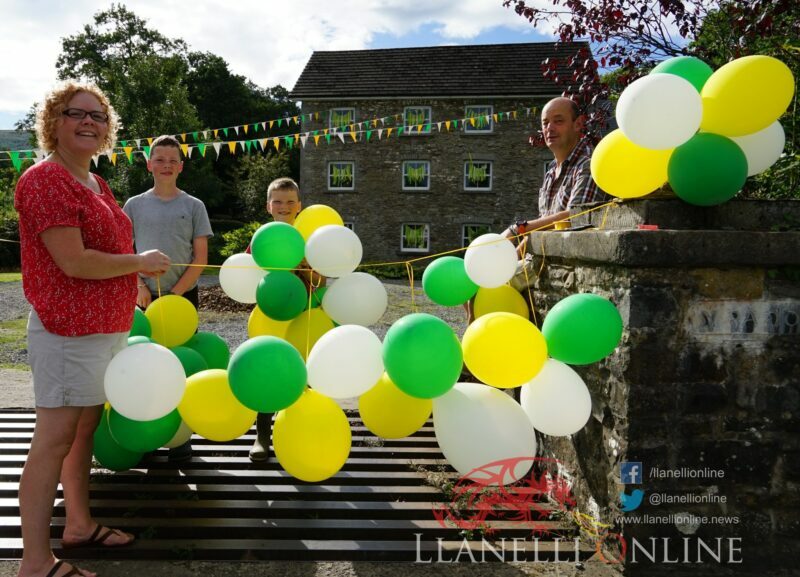 The school at Bethlehem also opened its doors and sold plenty of burgers and squash. 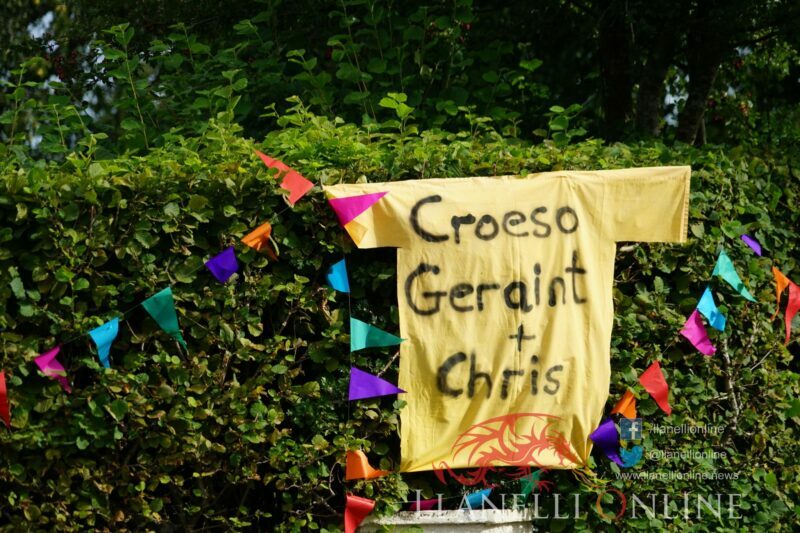 Homes along the route were decorated with bunting, Welsh flags and bicycles. 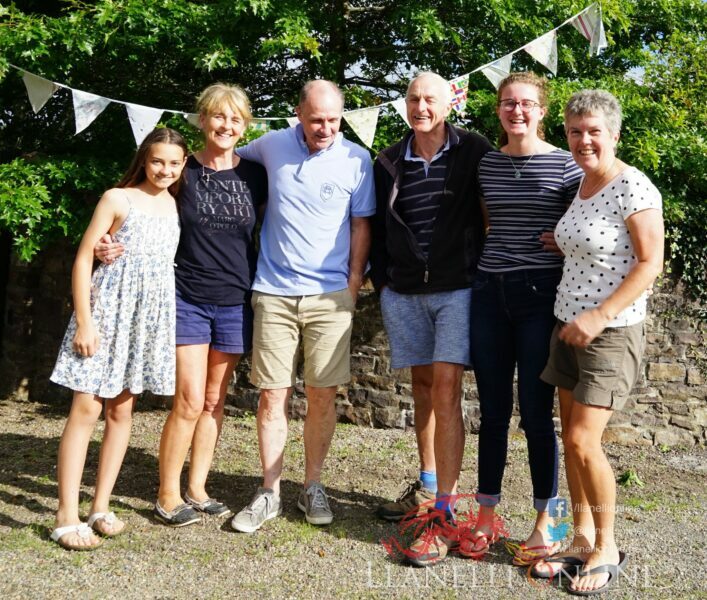 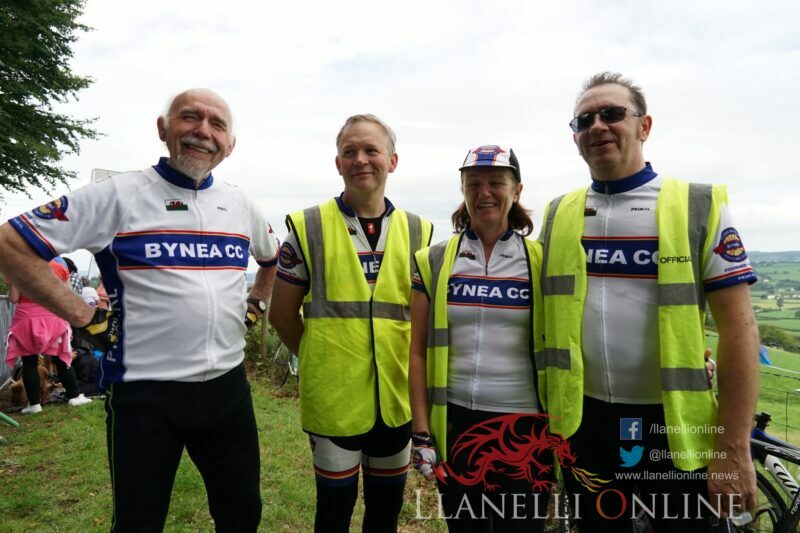 Cycling clubs including the Tywi Riders and Bynea CC made their way to Bethlehem Hill to show their support but some also had roles as marshals for the day. 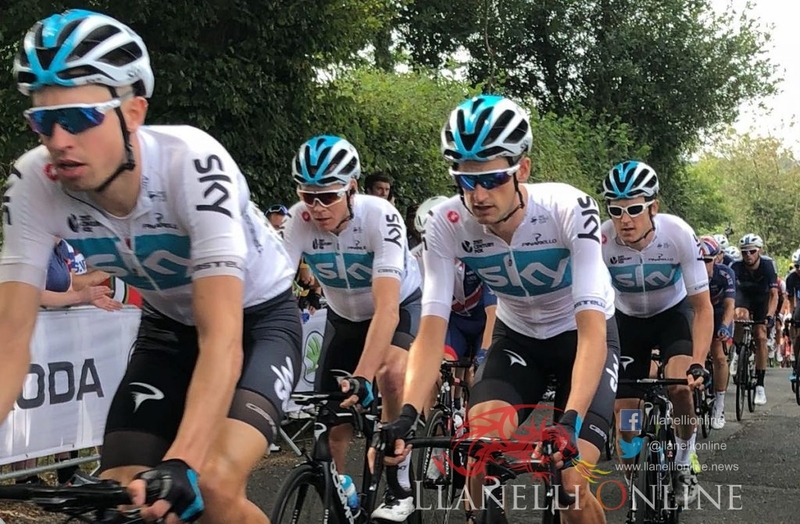 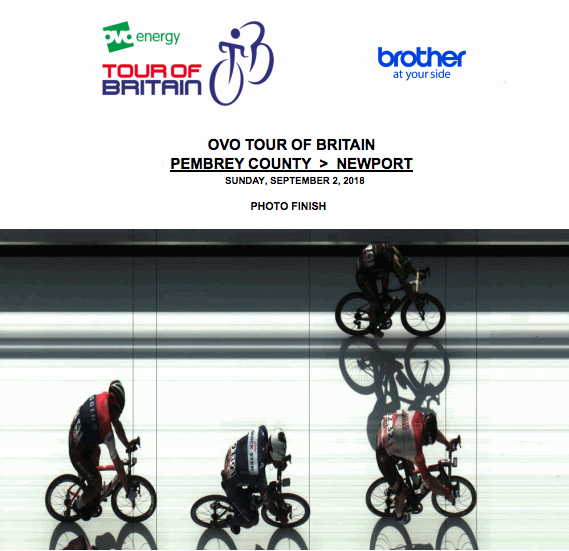 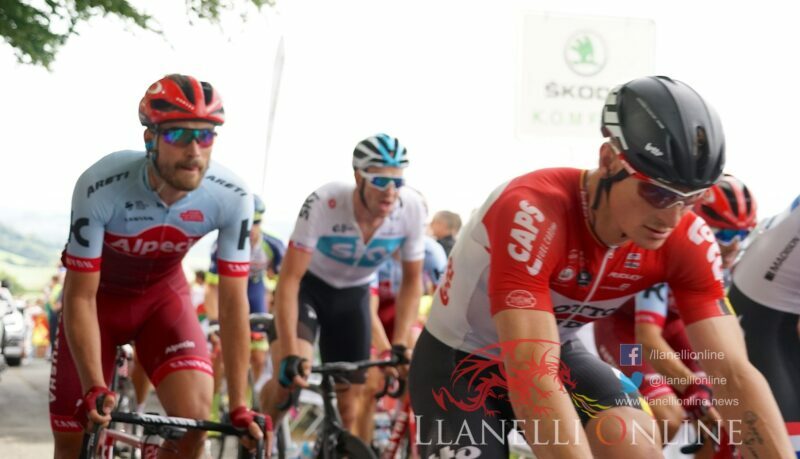 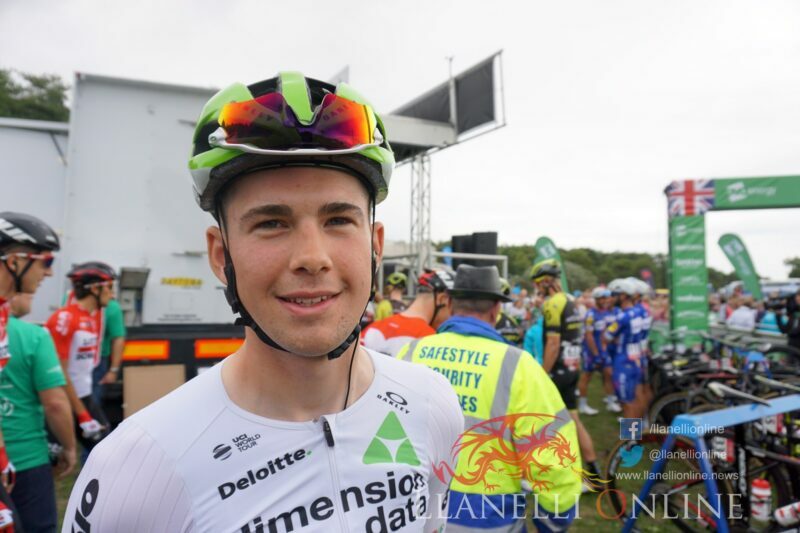 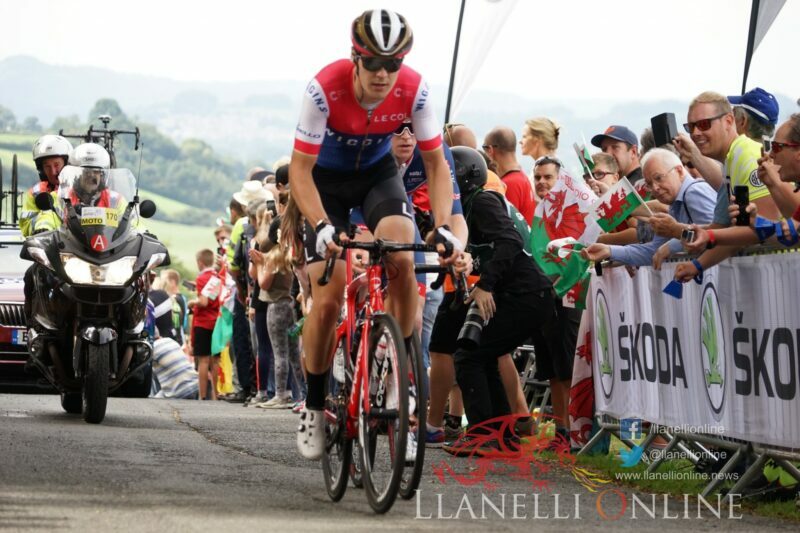 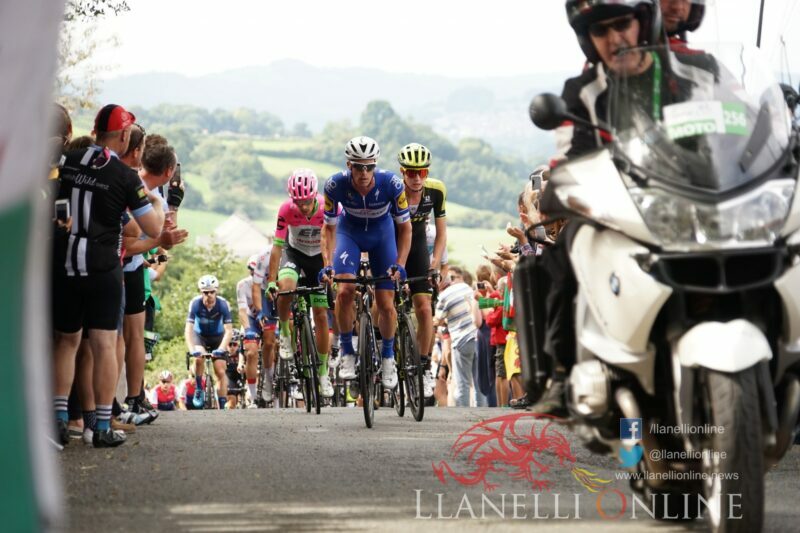 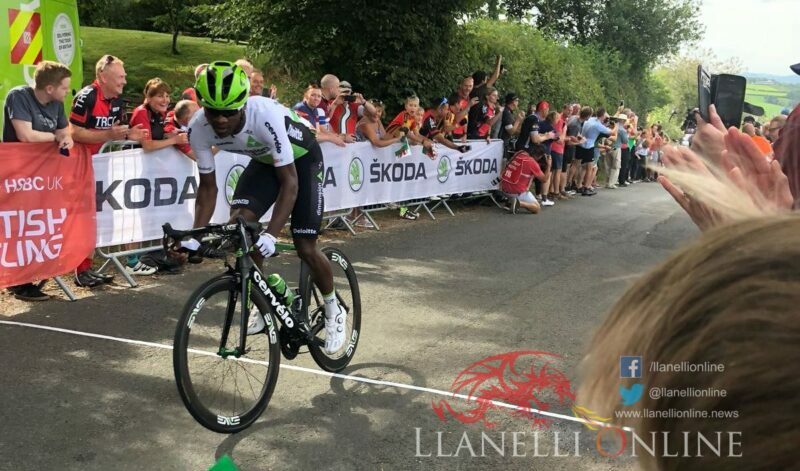 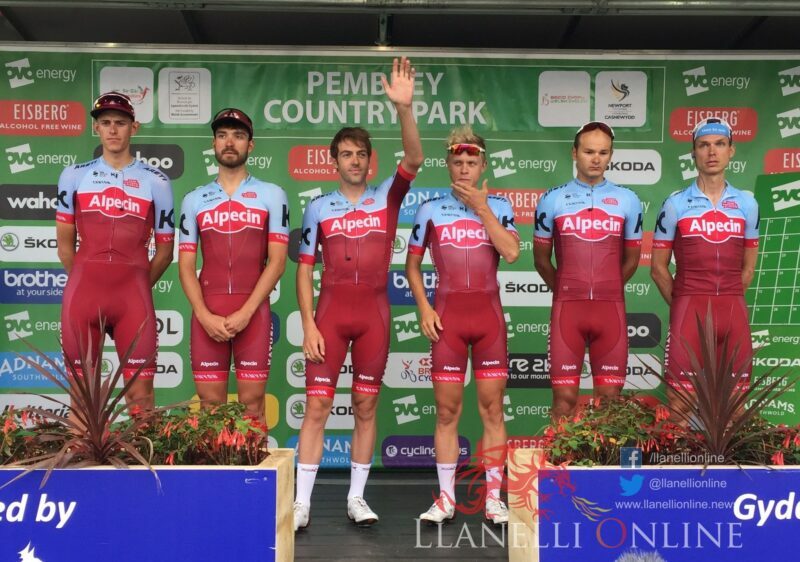 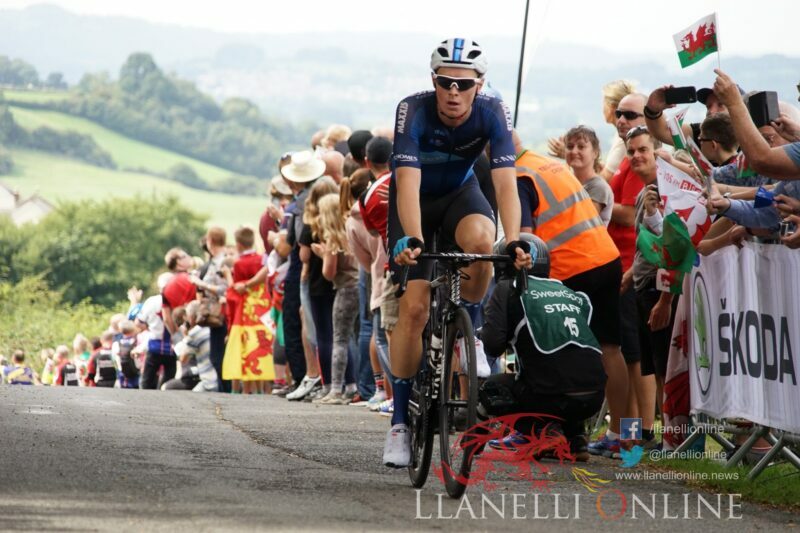 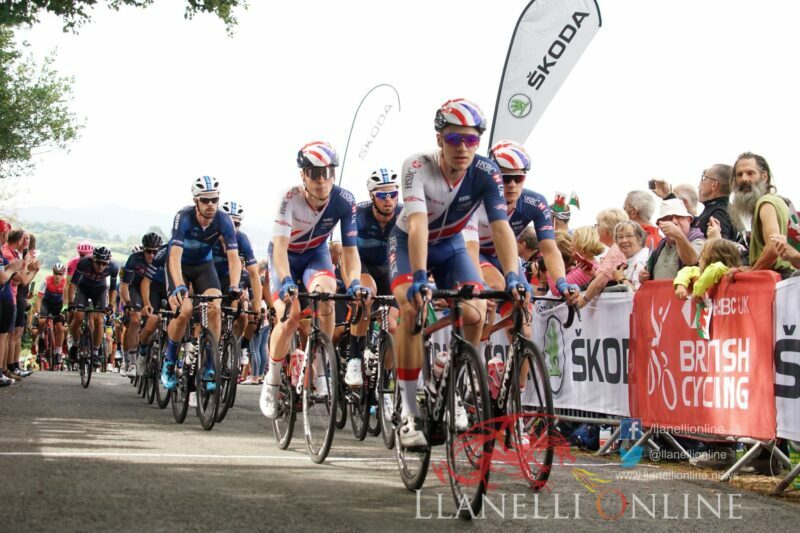 The excitement built as people shared TV footage of the race progressing through Carmarthenshire then for about 20 seconds the spectacle which is The Tour of Britain sped by led by Nicholas Dlamini. 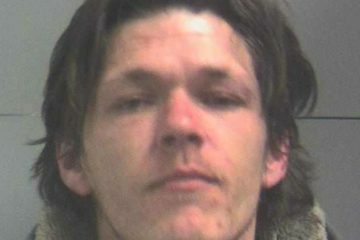 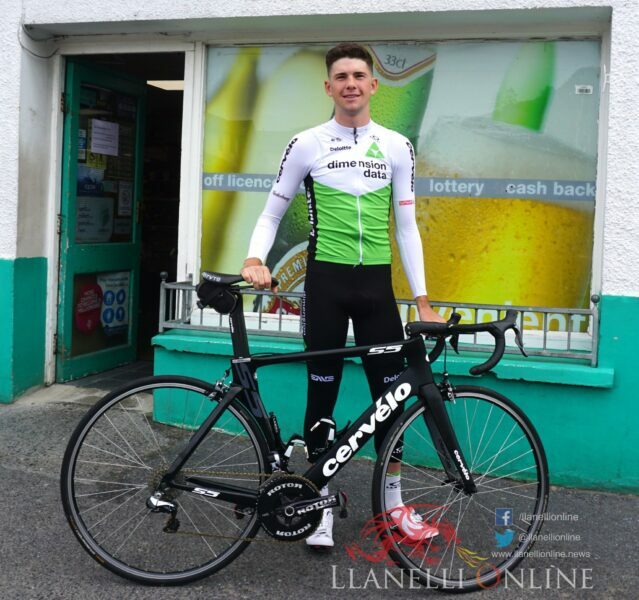 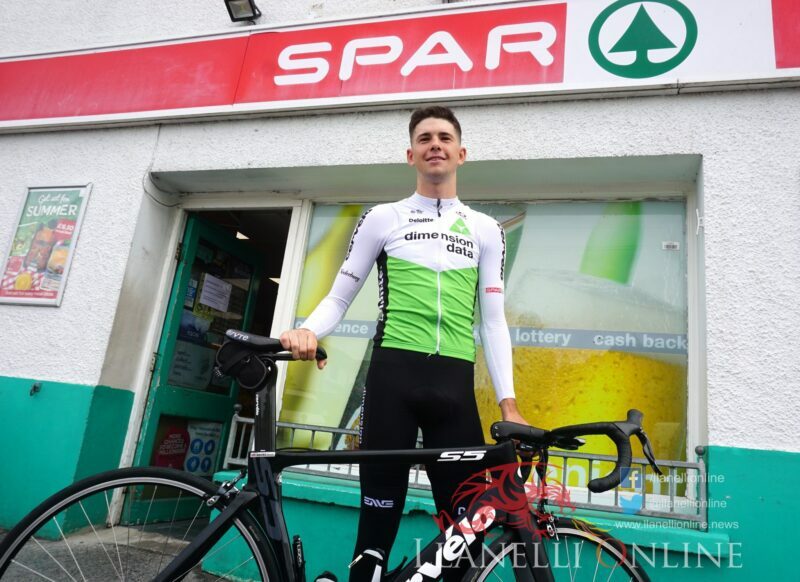 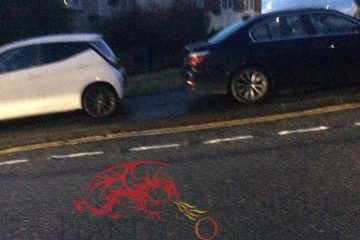 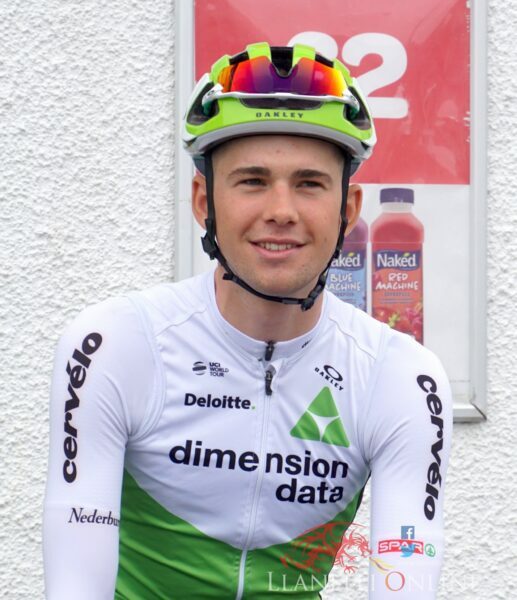 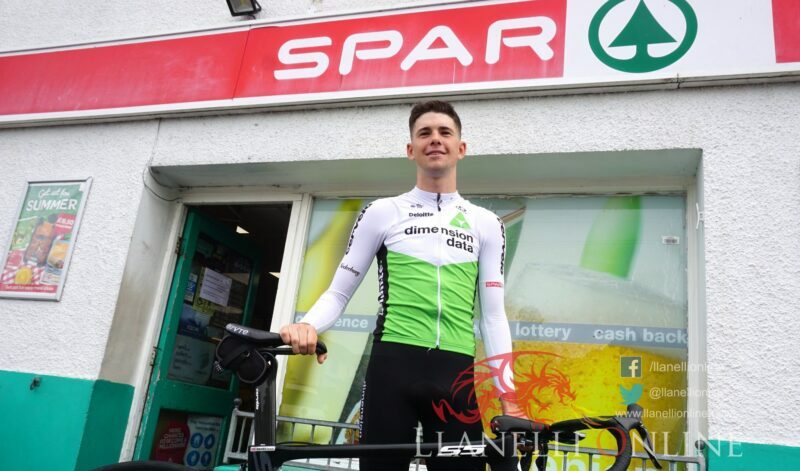 He had travelled from Llanelli to Bethlehem in the fastest time and took five points towards his eventual Skoda King of the Mountains jersey. 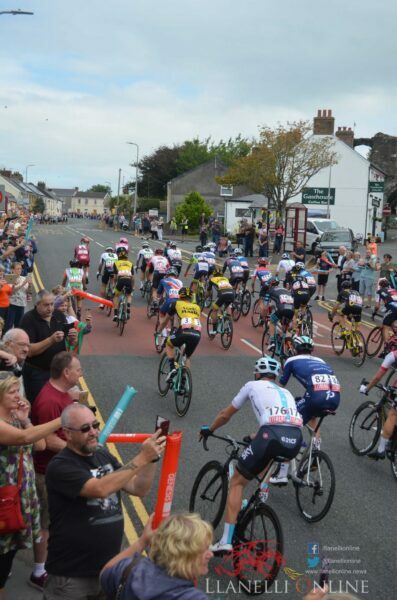 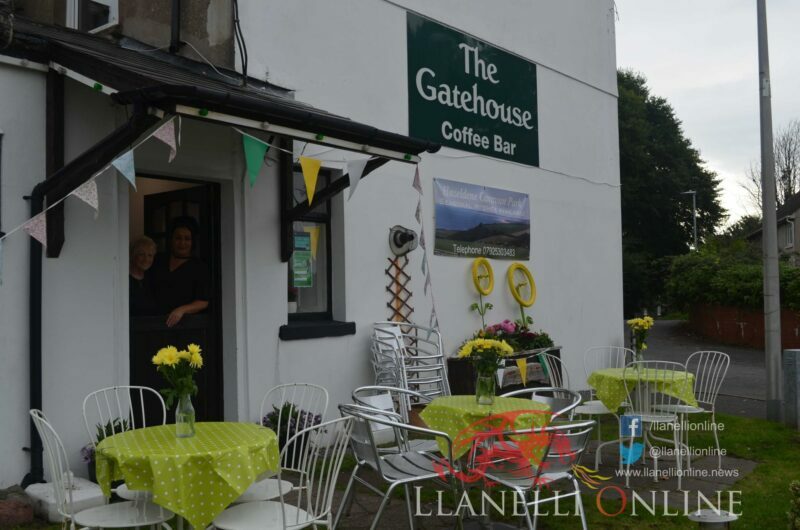 Many spectators said that the race was a great boost for Carmarthenshire however beginning on a Sunday meant that not a lot of businesses were actually open. 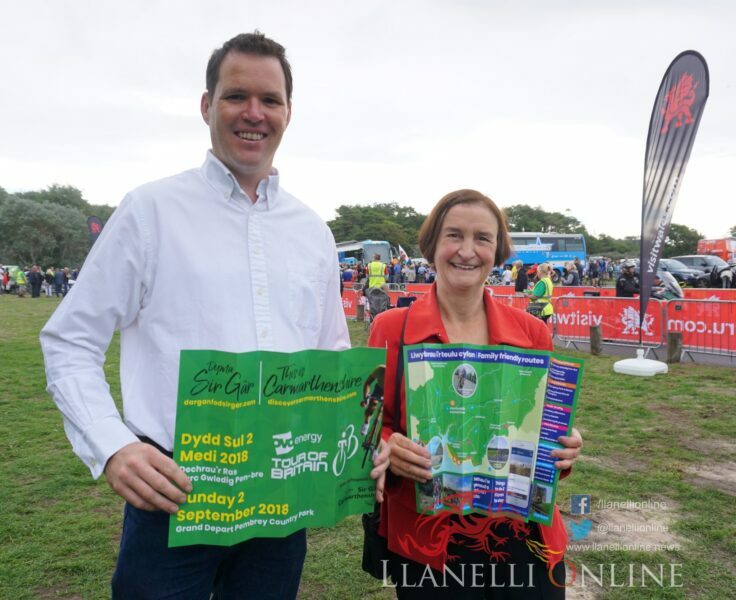 Carmarthenshire County Council produced a lot of literature ahead of the tour and will be hoping that there will be a significant rise in the number of visitors to the county. 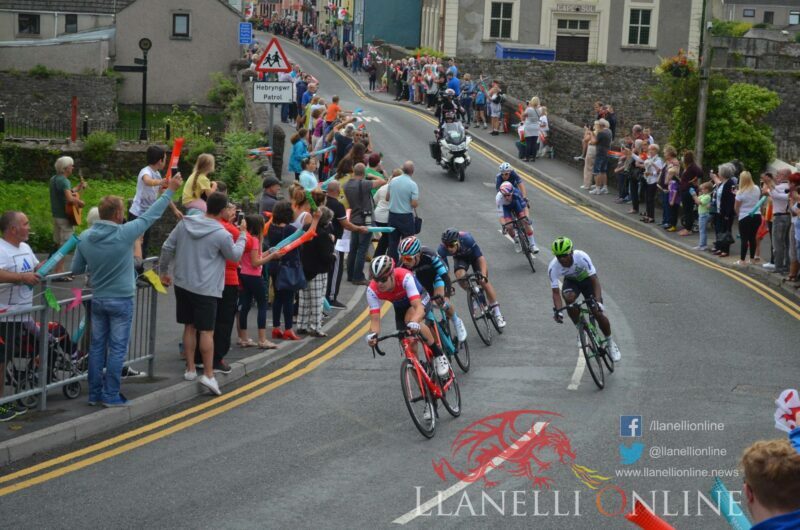 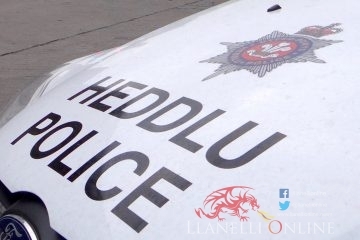 Llanelli Online had reporters at Pembrey, Kidwelly and Bethlehem. 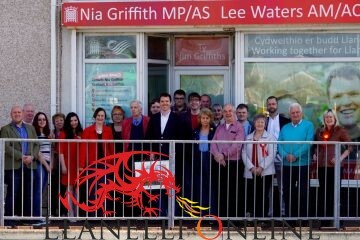 You can watch the fruits of their labour here. 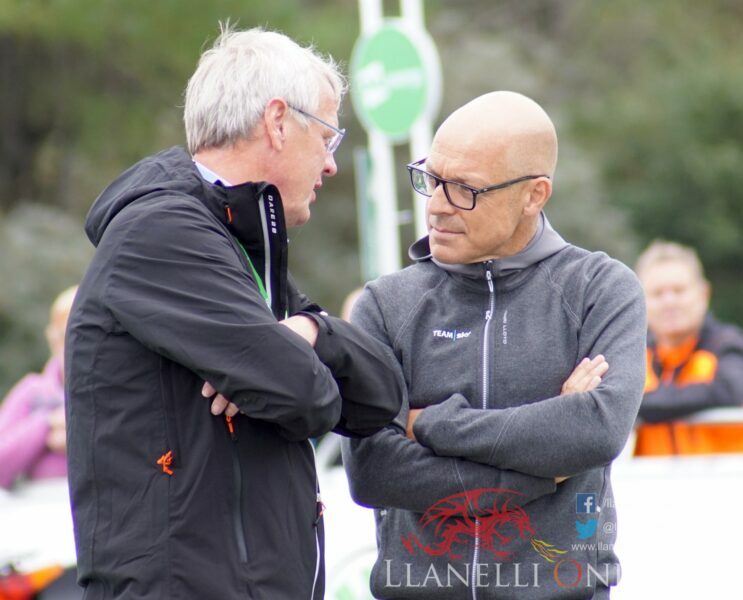 Photos: Alan Evans, Iwan Lewis, Peter Tully and Claire Thomas. 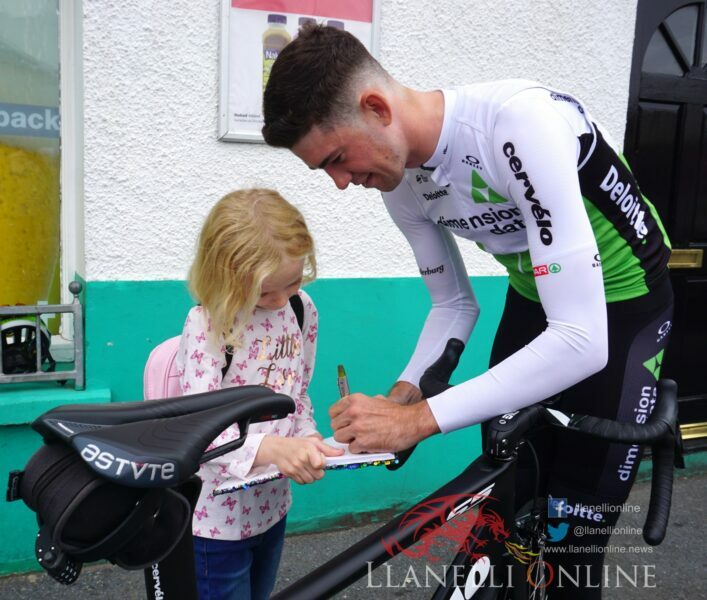 Look out for our special film of the Tour in Carmarthenshire here soon.